There are times when people wish to protect valued trees from being cut down by a beaver. Fortunately there are ways to protect particular trees without eliminating the beaver and the wetland ecosystem it creates. 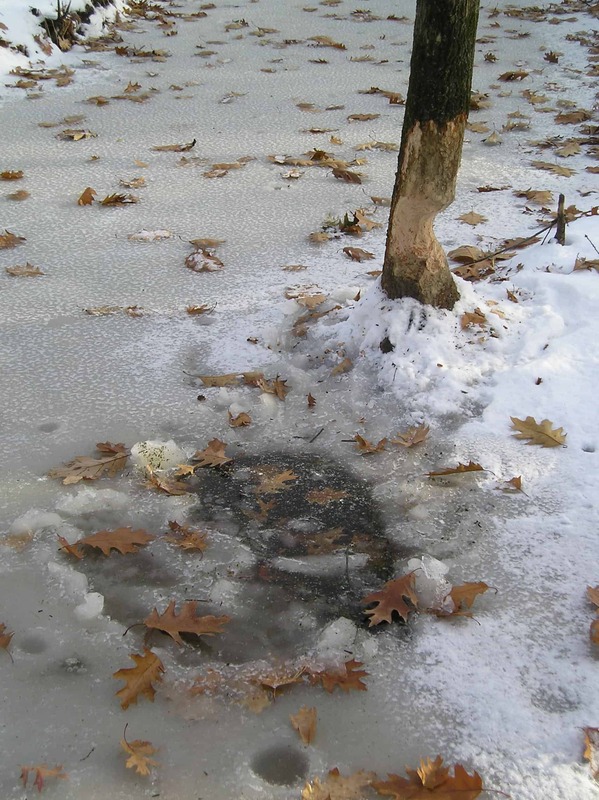 Most of the following tree protection techniques are inexpensive, reliable, and relatively easy for nearly any homeowner to do in a short period of time. Various styles of fencing can be used to protect individual specimen trees or a small grove of trees. Individual trees can be spared from beaver gnawing by placing wire cylinders around the base of their trunks. The purpose of the heavy wire cylinder is simply to keep the beaver from getting to the tree. This is our preferred method to protect trees from beaver chewing. The technique is 100% effective, it only takes a few minutes per tree, is inexpensive, and it will remain effective for many years with no maintenance! 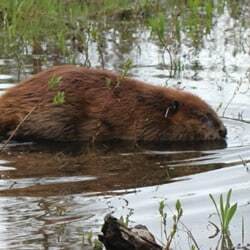 Since beavers use trees for food and building materials, fencing their preferred trees (such as aspen, poplar, cottonwood and willow) cuts beavers off from these needed supplies. This can make the habitat area less inviting for beavers. The tree trunk fence cylinders are best made from 2″ x 4″ mesh. Chicken wire often rusts out in a year or two, and hardware wire mesh is very noticeable and not very aesthetic. Various length rolls of the 2” x 4” wire mesh can be purchased at any home supply store. The fence height should be a minimum of 30 inches. In cold climates make sure the fence height is 2 feet above the highest snow level to prevent winter tree chewing. Often you will have a choice between galvanized, green or black vinyl coated fence. All work well, so for aesthetic reasons choose the color that best matches the color of your tree trunks. The initial gleam of the galvanized fence quickly fades to a nice dull gray patina which is barely noticeable on most trees. In addition to the correct height fence, you will need a pair of wire snips and gloves. Wire fasteners or small zip ties are optional. 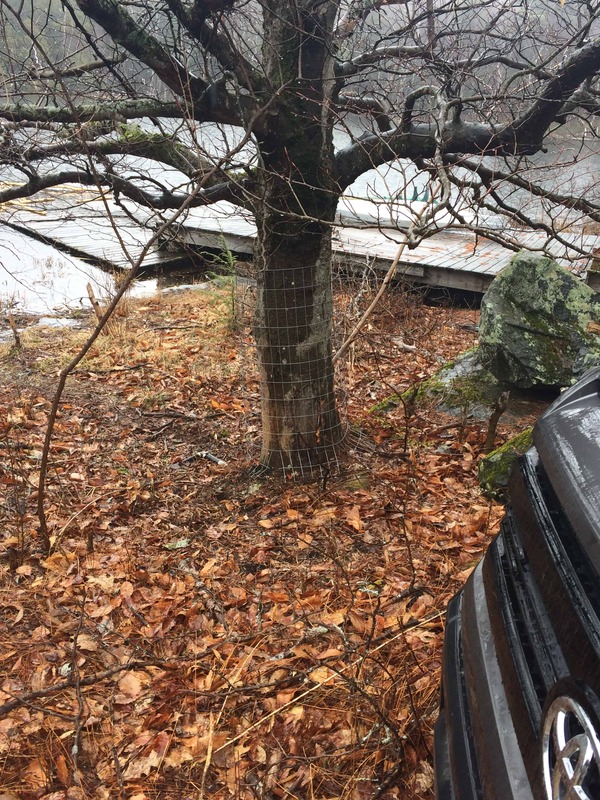 With simple wire snips cut a length of fence long enough to encircle the tree trunk while leaving a 3 – 6 inch gap between the wire mesh cylinder and the tree trunk. This gap allows for future trunk growth without girdling. Position the cut piece of fence around the tree trunk and use each of the wire prongs to fasten the sides of the fence, completing the fence cylinder around the tree trunk. Other fasteners (e.g. hog rings, zip ties, etc.) can also be used to fashion the cylinder. The cylinder generally does not need to be anchored to the ground. You can cut the bottom of the cylinder to fit a sloping ground, or to protect prominent roots from chewing. Replace the fence cylinder if it’s corroded or if room for more tree trunk growth is needed. Sometimes a person may wish to protect an entire stand of trees without wrapping each trunk individually. In this case a grove a trees can be protected by encircling all the trees with a fence. However, because beavers are good diggers, the entire fence needs to be installed in contact with the ground so that there are no gaps the beavers can exploit. In cold climates it needs to be 2 feet higher than the winter snow. 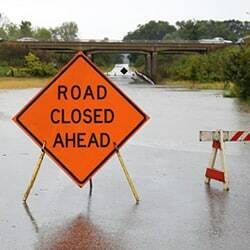 Some people have reported success with leaving the side furthest from the water open. See diagram. 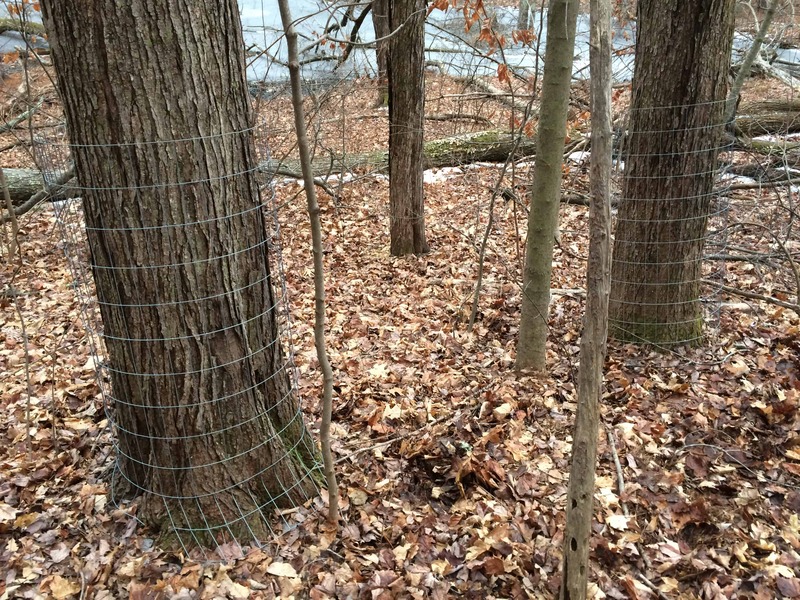 The fence can be simple 2” x 4” mesh secured on posts and/or against the tree trunks. However, often a roll of fence can be difficult to contour to uneven terrain. To deal with uneven terrain or for a more aesthetic look, some people have reported good results using an electrified fence placed 4” above the ground. These electric fence kits are often solar powered. They are commonly used by farmers and are usually available at farm supply stores. The electric fence is less noticeable than a large fence enclosure, which is good aesthetically for areas with high visibility. However, an electric fence needs to be inspected periodically to ensure that a tree branch doesn’t fall on it and short it out. 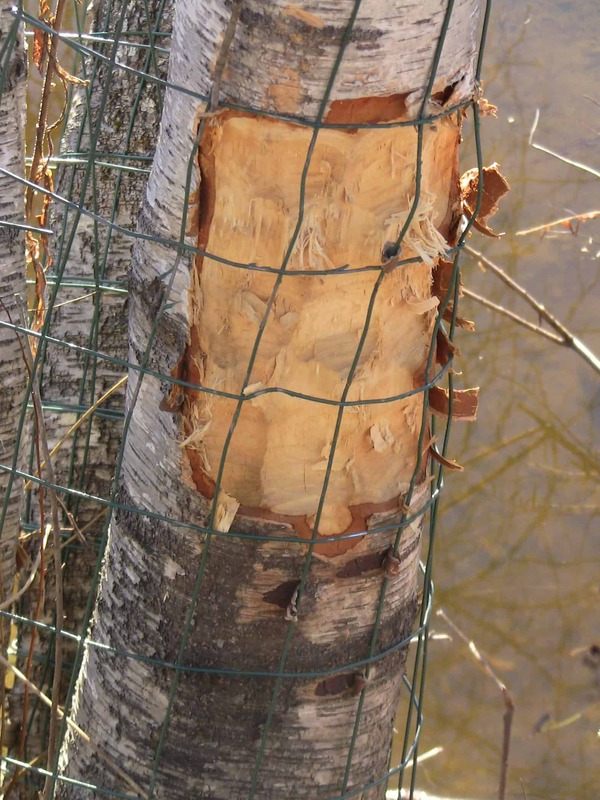 Many people have used an abrasive paint mixture to deter beaver tree chewing with great success. This is also the most aesthetic tree protection method. However, it is may not be 100% effective as is the tree wrapping technique. Mix 140 gm sand per liter of paint. Make in small batches at a time on the day you are going to apply it. Using too much sand will cause the mixture to roll off the tree. Apply paint to bottom three to four feet of tree trunk (2 feet above snow). Do not need to reapply for several years. Consider leaving some trees unpainted for beaver food. This formula does not work for saplings, so protect them with wire fencing. Vegetable or mineral oil infused with cayenne pepper and then painted on the tree trunks has also been reported as an effective means of preventing beaver chewing. Acknowledgements: Dr. Thomas E. Eveland, Ecology Consultant, The Fund for Animals and the “Beaversprite” newsletter. Disadvantages: It has been reported by a VT state official that applying this mixture has killed thin barked trees. May need to reapply annually. Why Do Beavers Cut Down Trees? Beavers use the trees they cut down for food, and they use the left over branches for building materials for their dams and lodges. In cold weather climates beavers are most active cutting down trees in the fall because they are preparing for the winter. Beavers do not hibernate, so they plan ahead and build a stockpile (cache) of edible sticks in order to survive the cold winter. They stick one end of these sticks in the mud at the bottom of their pond near their lodge so that when the pond freezes over and they can no longer access new trees, they can swim out of their lodge, grab a stick, and bring it back to the comfort of their lodge to eat. It’s hard to believe that beavers are able to chew right through the trunk of a tree, but they do. Beavers have very strong and sharp teeth which are paired with powerful jaw muscles. A single beaver can fell a medium sized tree in a single night! Beaver teeth never stop growing, so it is believed that beavers need to constantly chew wood to prevent their teeth from growing too long! Amazingly, due to a hard orange enamel on the front side of their incisors and a softer white dentin on the backside of these teeth, their teeth are self-sharpening as they chew on wood. As beavers chew the softer backsides of the incisors wear faster, creating teeth with chisel-like cutting surfaces. They also have molars which they use for grinding their food. Do they eat the wood? When a beaver cuts down a tree it wants to eat the inner, growing (cambium) layer of the tree bark. That is why they will nibble all the bark off the branch, leaving a debarked stick. They will also eat the fine twigs and leaves. However, they do not eat the inner woody part of the branches and tree trunk as they are unable to digest the wood. Once the bark is all eaten from a branch, they reuse the stick to build their lodges and dams. A beaver’s diet consists solely of vegetation. They do not eat fish or any non-plant materials. The reason they topple trees is to gain access to all the bark on the tree as well as the smaller twigs and leaves. Branches will be chewed off in sections that are small enough to drag into the water for safe and leisurely eating. The bark of large tree trunks will be chewed where it lies if the beaver can reach it. Beavers prefer to cut down smaller diameter trees because the bark is thinner and easier to digest, but they can topple any size tree. What tree species do they eat? Beavers have a definite preference for the trees they like to eat. Preferred tree species include alder, aspen, apple, birch, cherry, cottonwood, poplar and willow. Aspen/poplar and cottonwood are their favorite. If the supply of their preferred trees is low they will harvest oaks and some maples. Conifers such as pines, hemlocks, etc. are their least favorite. Sometime they will girdle (remove the bark around the entire base) of conifers for an unknown reason. One possibility is to obtain some needed dietary nutrient. Why do they cut so much in the fall? If you live in a cold weather climate you may notice that beavers cut down the most trees in the late fall. This is because they are stockpiling a food cache of sticks for the winter. Beavers do not hibernate, so they plan ahead and store a large cache of edible sticks underwater near their lodge in order to be able to eat once the ponds freeze. Once the pond is frozen over and they can no longer access new trees, they will swim out of their lodge, grab an underwater stick, and bring it back to the comfort of their lodge to eat the bark. How far from water do Beavers cut trees? Beavers are well adapted to water and evolved over millennia to use water as a defense from predators. While surprisingly fast over short distances, beavers nonetheless do not like to travel too far from the water to cut down a tree. Most trees that beavers cut down are within 100 feet of the water. As beavers deplete the supply of food trees close to the pond’s edge they will usually raise the height of the beaver dam to bring the pond closer to more distant trees. Another engineering trick beaver will employ is to excavate canals from the pond in the direction of the trees they wish to harvest. Once a tree is toppled they are able to cut off and transport the branches easier and more safely to the pond using their canal. Beaver are truly “Nature’s Engineers”! Dead trees are so destructive and ugly! The sight of dead, flooded trees (snags) seems very destructive and ugly to most people. However, snags are needed by many species of birds. Swallows, wood ducks, blue herons, eagles, osprey, woodpeckers, turtles and many others rely on these dead trees for food, shelter and places to perch. The death of trees may look destructive and unattractive to us, but they are a necessary and extremely important habitat to many other species in the ecosystem. The loss of these trees also allows significant more sunlight to reach the water. The sunlight, water, and suspended nutrients in the pond water combine to stimulate the immense growth of algae, microorganisms, invertebrates and aquatic plants that then become the foundation of the wetland food chain. These life forms become food for innumerable larger species and create a prolific biodiversity of species in and around a beaver pond. Beaver ponds are seven times more bioproductive than the most fertile farmland. They become magnets for wildlife. So at first glance the death of these trees appears to be a destructive act by the beaver, but it is actually an absolute requirement to support the abundance of life that makes these wetlands so valuable. Tree protection also modifies the habitat by decreasing the beaver food supply. The more trees that are protected the sooner the beavers will exhaust their food supply. Eventually they will relocate but it often takes years. Trapping the beavers preserves the food supply and will keep it attractive habitat indefinitely. In our experience trapping is a short term solutions as new beavers often relocate to the trapped habitat every year. Once an area is depleted of their preferred trees it won’t become good beaver habitat for another 10 – 15 years until new trees are large enough to provide adequate food. Wrapping the trunks of trees with fencing not only protects the trees from chewing, but also modifies the habitat by decreasing the beaver food supply. The more trees that are protected the sooner the beavers exhaust their food supply and will relocate. The area typically won’t become good beaver habitat for 10 – 15 years until new trees are large enough to provide adequate food. This is a longer term (and less expensive) option if there are limited number of trees to protect. There is more information about tree protection on our website.